SAN Fusion for Mac OS X is available from www.sanfusion.com as a disk image (dmg) file. Note: If your computer is not connected to the Internet, download the installer using an Internet-connected computer and move the installer to the target computer. You may be asked for an administrator name and password during installation. If you don’t have an administrative account, you’ll need to obtain one. Download the installer dmg file (SAN Fusion Install.dmg) to your computer. When you download or open the .dmg file with Safari, Mac OS X automatically mounts the dmg (if necessary) and runs the installer. When you download a dmg file using another Web browser, mount the file yourself. To install SAN Fusion, double-click the .pkg file (Install SAN Fusion.pkg) to run the installer. A window will open with instructions as well as options for choosing file locations and other custom settings. Note: Each time you open the dmg file or run the Mac OS X package installer, it displays the license agreement, which you must agree to before using SAN Fusion. Be sure to read the entire End-User License Agreement, and only click on I accept the terms in the License agreement if you agree with the entire terms of the agreement. Click the SAN Fusion application icon in the Dock. In the Finder, choose Go > Applications, or press Shift–Command (⌘)–A. Double-click the SAN Fusion application icon in the open Finder window. Important: Before purchasing a permanent license key it is strongly recommended that you request a trial license in order to test and evaluate the software thoroughly before placing an order. For this reason, it is pressumed that an order is binding after you have decided to purchase a usage license and the associated registration key whether you actually evaluated the software or not. Refunds will not be issued (excluding any potential faults on our side). An unlicensed copy of SAN Fusion allows you to add repositories and to create or delete workspaces. However, attempting to mount a workspace will result in an error. You must purchase a license for each computer that you intend to use with the SAN Fusion virtual file system. The license icon in the lower-left corner of the main window indicates whether the application is available, unavailable or temporarily-available to the end user. The red “x” icon indicates the application is not currently licensed, the license has expired or the license is not valid. The yellow “!” icon indicates the application is using a valid trial or temporary license key that will expire. An icon with no red “x” or yellow “!” indicates the application is using a valid permanent or site license key. Note: To view the license details without opening the Registration window, position your cursor over the license icon until a tool tip appears. Choose SAN Fusion > Registration. Click the Import License Key button to display the Import License Key dialog. Navigate to the directory where you saved the license you received electronically. Select the license file (.lic) and click the Open button to activate the license. This copy of SAN Fusion is now registered and you can mount workspaces without the error. The preferred method for registering SAN Fusion is to import a license file. If you are unable to obtain an electronic copy of the license file, the license information can be manually entered in the registration window. Select the license type from the popup menu. Enter the license details in their corresponding text fields. Click Save in the lower right-hand corner of the registration window. Note: The registration window requires the date string be formatted as YYYY-MM-DD. However, the date format the license file uses is seconds since the Epoch (i.e. seconds since 00:00:00 UTC, January 1, 1970). In the Finder, choose Go > Utilities, or press Shift–Command (⌘)–U. Double-click the Terminal application icon in the open Finder window. Enter the command date -jur <seconds> +%F to convert the date and time represented by seconds to the full date (i.e. YYYY-MM-DD). After your order has been processed, a permanent license will need to be generated before any Temporary or Trial licenses that were emailed to you expire. Locate the computer’s unique identifier in the Registration window. Click the Copy “Host ID” to Clipboard button and paste the copied string into a text file. Once you have collected all the computer’s Host IDs, email the text file to info@sanfusion.com. Be sure to reference your original order to avoid any processing delays. When you have received your permanent licenses, match the files to the correct computers using their unique identifiers and refer to the Registering SAN Fusion with a License File and/or Manually Registering SAN Fusion sections of this guide. Note: Using the Software Updater requires an Internet connection. You may be asked for an administrator name and password during installation. If you don’t have an administrative account, you’ll need to obtain one. Choose SAN Fusion > Check for Updates. A dialog will appear indicating whether you’re up-to-date or a new version of SAN Fusion is available. Important: SAN Fusion uses the same software update framework for both updates and upgrades. The difference being that a “software update” is usually downloadable free of charge; a “software upgrade” usually is not. To determine if a new release is an update or an upgrade, always refer to the Release Notes before installing to avoid possible downtime. Select the workspace in the list and click the unmount button at the bottom of the window. Select the workspace in the Finder and choose File > Eject. If you have not already done so, choose SAN Fusion > Check for Updates from the SAN Fusion menu. When you are done reading the accompanying release notes and have determined you may proceed, click the Install Update button in the lower-right corner of the Software Update window. Unmount any active SAN Fusion mounts and close the SAN Fusion application. Double-click the installer dmg file (SAN Fusion Install.dmg) to open it. To uninstall SAN Fusion, double-click the Extras folder to open it. Double-click the .pkg file (Uninstall SAN Fusion.pkg) to run the uninstaller. Follow the onscreen instructions. Important: To complete certain tasks, you must enter the name and password of an administrator to verify that you are a user with administrator privileges. If you don’t know an administrator name and password, ask the person who set up your Mac for help. For file-based storage abstraction, SAN Fusion uses the concept of storage repositories and workspaces. A storage repository is essentially a folder at the root of a file system that defines where SAN Fusion workspaces may reside. Xsan-based repository: Avoid using native extended attributes and always use case sensitive volumes for best results. StorNext-based repository: Leave Named Streams support disabled when creating StorNext volumes. NFS-based repository: Exporting user ID mappings (i.e. root_squash, all_squash, anonuid and anongid) from the NFS server is not supported. It is highly recommended OS X clients implement NFS automounts with autofs. It is strongly recommended OS X clients be minimally configured to use the default mount options vers=3,tcp,resvport,rw,rdirplus,nfc. Use of the NFS mount option async is discouraged. Refer to the auto_master and nfs.conf man pages for more details. DAS-based repository: Locally formatted Mac OS Extended disks may be used to demonstrate and/or evaluate the merits of the software. It is not intended for production use. Note: Support for NFS-based Workspace Repositories requires a qualified NAS appliance. The maximum file system size SAN Fusion supports for a single NFS volume is 64 TiB. Choose SAN Fusion > Add Repository. Select which storage to use by checking its checkbox. A dialog prompts you to install the default-set of workspaces. The default-set of workspaces are Audio, Video and Graphics. Click the Install button to create the default-set of workspaces or exit the dialog by clicking the Not Now button. Note: When adding a storage repository, before exiting the SAN Fusion Setup window, you will be prompted to install the default-set of workspaces. To disable this prompt, select the “Do not show this message again” checkbox before continuing. Workspaces are virtual volumes that exist as files within a storage repository. Workspaces allow you to use non-Avid storage to share projects and media between users. Choose File > New Workspace, or press Shift–Command (⌘)–N. Click the new workspace icon at the top of the window. In the Workspace Name field, enter a name for the workspace. Be certain to use a unique name for the workspace so as not to conflict with another volume’s mount point. When working with multiple storage repositories, avoid reusing the same workspace name if you intend for the workspaces to be mounted simultaneously. Optionally, select the Custom radio button to manually configure the workspace’s User and Group access privileges. Otherwise, leave the default Everyone Read & Write radio button selected. Before deleting a workspace, make sure that its media is no longer needed, is moved, or is backed up and that it is not currently being accessed by any clients. You then can safely delete the workspace. Select the workspace in the list and click the delete workspace icon at the top of the window. A dialog prompts you to confirm the operation. Click Delete and enter an administrator name and password. 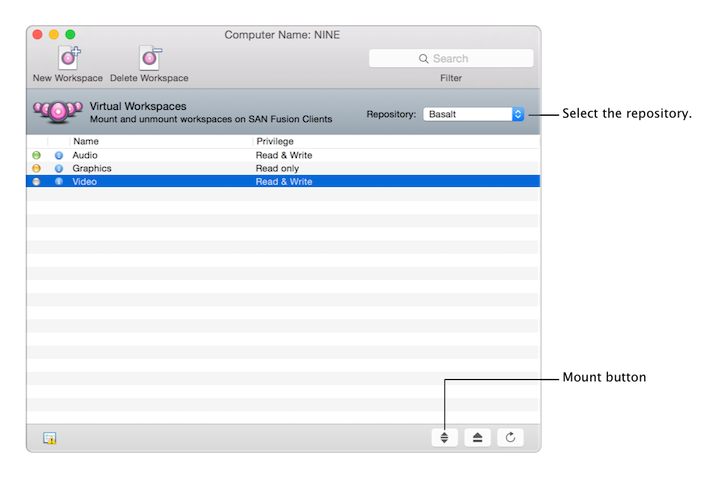 Workspace names must use Unicode characters and cannot include a space. When working with multiple storage repositories, avoid reusing the same workspace name if you intend for the workspaces to be mounted simultaneously. Do not use a period (.) as either the first or last character in the names you create. Select the workspace in the list. Click the mount button at the bottom of the window. Double-click the mount icon next to the workspace name in the list. The mount status icon for the workspace will change colors accordingly. A green status icon indicates a workspace is mounted Read & Write, a yellow status icon indicates the workspace is mounted Read Only, and a red status icon indicates a mount error. Note: Mount errors are typically accompanied by an alert specifying details about the error. Error messages can be useful in determining why a particular mount failed. When contacting support about mount errors, be sure to mention any error messages you may have encountered.